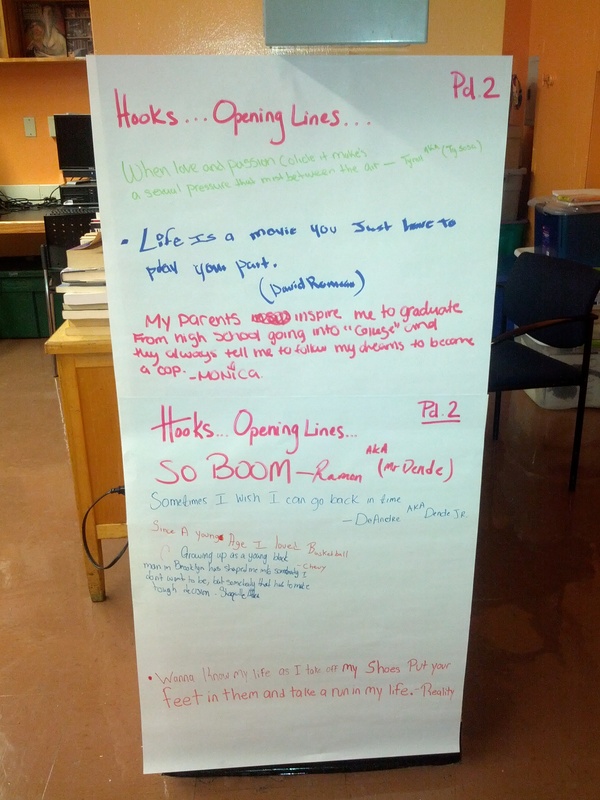 Recently, Jackie humorously infused pickup lines and leads into her lesson to engage students in narrative writing. It got me thinking. While I am not nearly as funny as she is, I still needed to find a way to minimize the angst with starting a written piece. Students deserve an opportunity to look at opening lines so they are innately thinking like writers. Providing them the opportunity to authentically explore various ways to open their stories is key. So, we gave it a whirl. Objectives: Students will recall moments in their lives that have shaped who they are today. Drawing from their own life experiences students will distinguish what moments they are willing to chronicle in their personal narratives. Students will construct meaning about their personal experiences by creating a written piece that utilizes author’s craft that has been studied and analyzed. Lesson: Let me say that I typically do not focus on opening lines, hooks, what have you until after students have written their pieces. I find that students are able to more easily and comfortably play with their opening once they know where they’re going…or have gone… with their narratives. Yet, I was curious to see how this would pan out. What moment has occurred in my life that I am (still) confused by? What is the most life changing experience I’ve encountered? What decisions have I made during this situation that have shaped who I am today? Who is important to me? Who has made a tremendous impact on me (positive, negative)? Do I find conflict in this? What simple pleasures do I relish in when times get tough/stressful? These questions, among many others, started getting our process underway. Students had choice and freedom in picking what they wanted to write about – as we know personal narratives are sometimes brutal to compose: sometimes we want to forget what we’ve been through. Yet, in order to foster the writers in room 369, these questions were written in the first person. When we write questions for our writers in the second person (What simple pleasure do you relish in when times get tough and stressful?) we are providing them an opportunity to take a step back; to be a bit removed. When we shift our curiosities to “I” “Me” “My”, it becomes personal. This visual represents our thinking at the very beginning of this school year. Students are playing with this deep level of thinking and crafting for the very first time. There is still some apprehension and hesitation, but for the most part students are willing to try…and play…and craft…and find their inner brave. As writers we know that it takes much patience and practice to feel satisfied with our writing; specifically our opening lines. Asking students to try writing their pieces from two different starting points allows us to see where our writing goes. Maybe one start is stronger, prompts more thinking while the other falls flat. Maybe they both prompt great confidence in continuing to see how they develop. Maybe the best draft ends up being an infusion of both. Regardless of where our personal narratives go, starting the process with options both in craft and experience, the pressure of writing is minimized and students feel more at home reliving some of the moments that would have never made it to the paper prior. How do you foster the willingness to write when fear or apprehension stand in the way of our writers? What techniques do you use as a writer that you channel to your student writers? ← Are you noticing what matters? Love the use of IR books as a sample for exploring. Fantastic!